Windows are important for a number of reasons. They help shed natural light on the interior of the commercial building, but they can also offer insulation and access to fresh air. Aluminium windows can be an excellent option for industrial buildings. They are standard for several commercial warehouses and other buildings that house large machines, such as factories. They offer large openings for natural light and are sturdy enough to withstand elements. PVC-u windows can offer better insulation and are usually excellent if you need slightly smaller windows for an office building or even a brick and mortar location for a business. This technology seals the glass for a more secure, protected window that lasts a very long time without becoming weakened or brittle from sunlight. There are also timber and hybrid windows. Timber windows have wooden frames, and they can be a great option if you’re looking for something with nice aesthetics. Commercial windows and doors can also come in hybrid form, a technique that utilises both a timber and an aluminium frame for an especially good-looking, sturdy window that lasts a long time after installation. 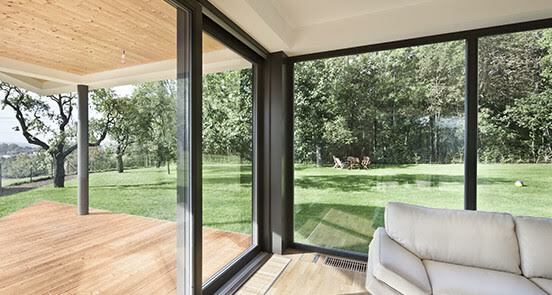 Doors typically come in the same forms as commercial windows. There are aluminium, PVC-u, timber, and hybrid doors to choose from. However, the important thing to note about commercial doors is the locking system. Because windows are often less accessible, there are usually fewer options when it comes to locking devices. Doors can have locks that can be opened with keys, keycards, or keypads that you press in order to gain entry. But there are also other types. You’ll need to determine what kind of locking system you want based on the location of your commercial property and the level of security you feel like you need. If your property is constantly staffed, you might need less security than a property that closes for the evening. If you’re looking for a contractor or company that installs doors and windows that are used for commercial property, you have a few different options. First, you can try online or look in your local directory. Once you contact a contractor, they’ll tell you about the types of windows and doors available for installation. They might also offer advice by asking where your property is located and what kinds of security you’re looking for. Once you’ve made a decision, you should be ready to go and should expect the installation company to have the project done soon.